A 2,600-year-old work of art is to be brought back to life with the aid of a Portsmouth firm. Iraq, devastated by war, is gradually beginning to rebuild its industries, and one of its core traditional crafts is making some of the world’s finest rugs and carpets. Now, thanks to a delivery of finest sheep’s wool to Baghdad from across the border in eastern Turkey by Portsmouth shipping specialist Mercator Cargo Systems, work is under way on reviving this ancient craft. 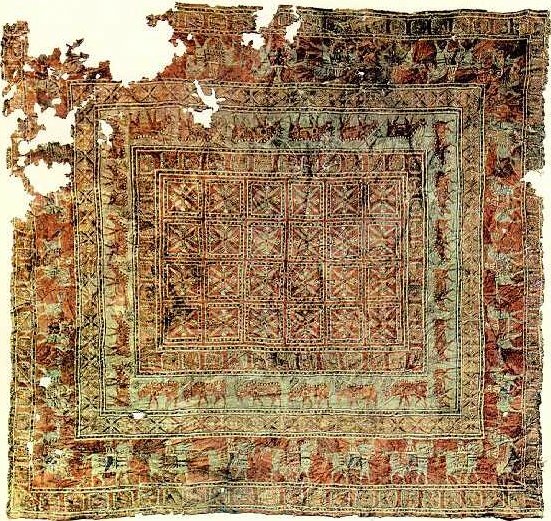 The Iraqi labourers have begun a project to produce replicas of the Pazyryk Rug, the world’s oldest surviving carpet, believed to have been made in Mesopotamia in around 600BC and now preserved in a museum in St Petersburg. Previously, the factory had been reduced to making tacky designs from poor quality fibre mixed with nylon, many of which ended up in Saddam Hussein’s tasteless palaces. But a top-grade Kurdish sheep’s wool has now been sourced capable of doing justice to the millennia-old Pazyryk, and with its history of carpet expertise Mercator Cargo was chosen to deliver the raw materials – and may get the chance to deliver the finished articles to the West. Paul Goehlert, managing director of Mercator, based at St George’s Square, Portsmouth, said: ‘The Pazyryk was found in Siberia. It was frozen and they actually managed to work out, don’t ask me how, that it was made in Mesopotamia. And when they gave the Baghdad factory a project, they thought they’d do a copy of it. The operation is headquartered in the Kadhimiya district of the capital, and employs around 750 staff. It is run by 60-year-old English businessman Richard Ringrose, under contract from the US Department of Defence. He has worked with Mercator for many years, and although Mr Goehlert said the project would have got off the ground even without Mercator’s help, it was especially gratifying to be involved – for sentimental reasons. ‘I started, aged 10 or 11, running around the City of London as a messenger boy during the holidays. One of the warehouses I went to one day was full of all these Oriental rugs, and I’ve just been gobsmacked by them ever since,’ Mr Goehlert said.